Kenzan Tsutakawa-Chinn is the founder of Studio 1 Thousand, a Brooklyn-based lighting design studio that specializes in complex LED installations. These are often placed in large architectural settings, such as building lobbies or concert halls. For his exhibition Illuminant Surfaces, Tsutakawa-Chinn has created a number of smaller-scale wall works that respond to and engage the more intimate nature of a contemporary art gallery setting. At the heart of Kenzan Tsutakawa-Chinn’s vision is an exploration of the interactions of scalable technology, 3-dimensional geometry, and the optical effects of advanced light and color design possibilities. His varied projects to-date have incorporated a significant degree of collaboration and an intuitive understanding of the balance between materials and industrial design, as well as the relationships between space and form. One example of this would be his collaboration with Studio Joseph to create a site-specific light sculpture for the Museum of the City of New York. Over 5,000 light diodes were strung and suspended in the museum’s stairwell, creating a glowing geometric field of light. It redefines what was previously an overlooked gap in the building’s architecture, claiming for itself a central role that is both ethereal and impossible to ignore. In 2017, Tsutakawa-Chinn collaborated with Helen Kozora-Tell to create “Inside The Kaleidoscope” for the Portland Winter Light Festival. Moving beyond the earlier designs that accentuated a single location in a previously constructed space, the Kaleidoscope project was created to be an entire experiential environment. Tsutakawa-Chinn combined LED strips, LED washes and mirrors that distributed and reflected both an overall light atmosphere and smaller points that counterbalanced it. Visitors were invited to enter the tent and sit on the floor, where they were surrounded by the mirrors. The light that bathed the viewers in evolving color patterns simultaneously stimulated the central receptors in both their visual and cerebral regions. Now, in Illuminant Surfaces, Kenzan Tsutakawa-Chinn has streamlined and scaled-down these techno-visual experiments. He presents a series of works that can be viewed both individually and in relation to each other, utilizing some of the newest technologies in computer-aided light and industrial design. 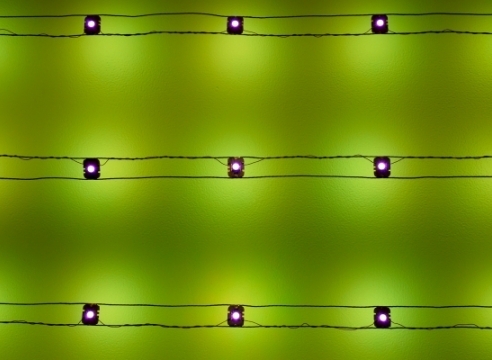 In the Energetic Discourse Series, LEDs hover over an undulating matrix. The structure’s pattern is designed in CAD software, and then carved into urethane foam blocks through a 5-axis router. The artist then applies a layer of silver gild. The resulting metallic concave hexagons collect and also refract the warm light beamed down from the diodes. The wall sculpture projects several aspects of our natural world. Nature often prefers the hexagon shape in it’s own designs, as this is one of the most efficient methods for fitting identical units (atoms, honeycombs) into flat planes. The sculpture also has the overall shape of a wave flowing through space. This is indicative of the property light, where a photon is both a wave and a particle at the same time. This dual-nature of light can also be seen in the Residual Comparisons series. Here, Tsutakawa-Chinn has created curtains of light by suspending dual-mounted LEDs on metal wires, which are suspended from metal bar-mounts. The LEDs rotate through computer-generated patterns and time durations. One set faces the wall, bathing it in a wash of color. The other set faces the view, presenting individual color units. Again, the form lets us contemplate the nature of light as both wave and distinct particle at the same time. The contrasting nature of atmospheric and particular color fields stimulate the viewer’s optical sensibilities in divergent but interesting ways, as does the inclusion of time as the fields change their palettes and relationships with each other. This exhibition represents a unique opportunity to introduce the artist’s practice for advance environmental light design into the gallery realm. The gallery would additionally like to thank the Brooklyn-based collaborators who worked with Kenzan Tsutakawa-Chinn to bring that vision to fruition: Chaz Capobianco of Capoco, Kevin Kleber and everyone at Rush Design.